We've been back two days now, after a 25 days trip, what an adventure!! We're coping well with not too much jet lag, I went right back to work, and life is getting back to normal quickly, except the laundry!!! And probably most memorable of all, snow in Central Park! And here's my first layout for the trip. 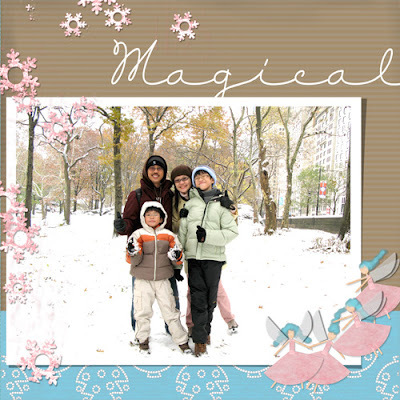 None of us had ever seen snow falling before, and we were rewarded with our first snow on our second day in New York, our first sight of Central Park was really a winter wonderland - a truly magical morning! By the way I used a mini kit I made and shared on my blog last year, finally I get a chance to use my own snowy christmasy light colored papers! Thought I'll share them again to say Blessed Christmas to everyone! So glad you are home safe and sound! It sounds like your trip was wonderful and I look forward to seeing your los! Thank you for the gift-I will think of you when I use it! Your little kit is so cute! But it's your great page made with it that made me really take interest. Thanks so much for sharing and GREAT JOB! Very lovely. I'm glad I found your blog. So glad you made it back safe and sound and that you had a wonderful time. You really made the round didn't you? From New York City to Orlando, wow. I've been waving at every plane that has gone overhead since you left, just to make sure I got yours, LOL. Your picture is fantastic and the layout gorgeous. (thanks for sharing the kit with us again). Looking forward to seeing many more pictures in the days ahead. Thank YOU very much! and Merry Christmas! What a nice trip! Thanks for the beautiful kit and Merry Christmas!! 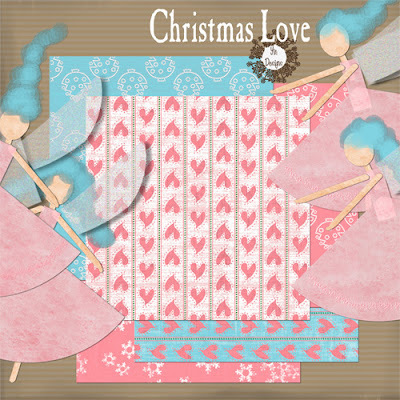 Love the colors in this great freebie! I would like to know the font name you used writing the word "Magical". I think your designs are marvelous, and thanks for sharing.